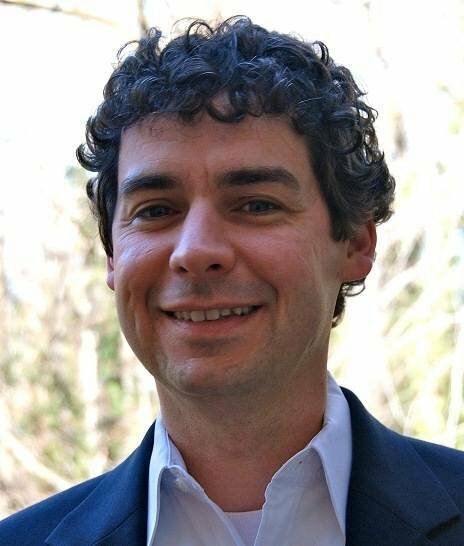 Companies should use SAP Information Steward's Metadata Management tool to avoid 'broken' BI reports, writes SAP expert Don Loden. As a business intelligence consultant, I've found that even sophisticated customers using SAP Business Objects business intelligence software together with SAP NetWeaver Business Warehouse (BW) share the same question: How can I know what effect a change in a Business Explorer query will have on my business intelligence reports? The answer to that question is to use SAP Information Steward's Metadata Management tool. Confusion over how changes in Business Explorer (BEx) queries will affect reporting typically occurs when, as the needs of the organization evolve, the transformational logic that is created in the BEx query in BW is often enhanced or altered by changes made in the SAP BusinessObjects BI reporting layer. The changes on both sides work well until one end of the equation is altered. When this happens, unexpected results are introduced into the reports and the change "breaks" the report in the eyes of frustrated users who had come to rely on the previous reporting structure. These consequences are impossible to predict without being able to consider both sides in a more proactive, intuitive way. Just knowing what data is used, as well as how the data is used from SAP NetWeaver BW to SAP BusinessObjects BI at the field level, is powerful information for an organization. Organizations often mention that there is no way to obtain this information in their current enterprise landscape. This does not have to be the case. SAP Information Steward's Metadata Management module can be used to give an organization this insight into their data. SAP Information Steward is multifaceted application with many different uses. While it's familiar to many organizations, most gravitate to SAP Information Steward's Data Insight module for data profiling and data quality. However, many organizations overlook the powerful metadata capabilities that exist in SAP Information Steward's Metadata Management module. That's a mistake. By making one connection to SAP BW and another connection to SAP BusinessObjects BI and running a data collection task both sides of the earlier noted change scenario can be easily seen. I'll illustrate this ability with SAP Information Steward later in the article, but let's first look at establishing a connection to both systems. Consider the following two figures that show connections established in SAP Information Steward first in Figure 1 to SAP BW, and then to SAP BusinessObjects BI in Figure 2. Connecting to SAP BW and SAP BusinessObjects BI in SAP Information Steward is fairly straightforward. The user specifies system information and credentials to enable a connection to SAP Information Steward to both SAP NetWeaver BW and to SAP BusinessObjects BI. This is something that is set up one time and then multiple collection tasks can be run to gather data in either an ad hoc manner or on a scheduled basis. To run the collection tasks in an ad hoc manner for either system, you would select the connection you wish to run and choose the Tasks menu and click Run Now as shown in Figure 3. The metadata collection task may also be scheduled to run at periodic intervals by selecting Schedule on the pop-up menu shown in Figure 3. 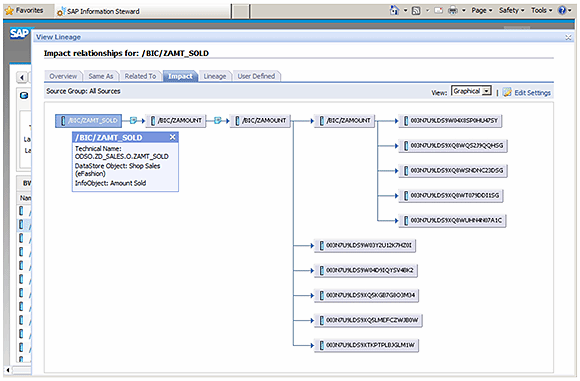 With either method, ad hoc or scheduled, a metadata collection task then runs in SAP Information Steward to gather the data from the respective connection. This happens both for SAP NetWeaver BW or SAP BusinessObjects BI. The methodology behind each task type varies by system type, but the outcome is the same. After the metadata collection tasks finish and metadata have been gathered in SAP Information Steward, the data is ready for presentation in the SAP Information Steward application. You can see the collected metadata information from both sides (BW and BusinessObjects) in the SAP Information Steward Metadata Management module. Consider the lineage of the BusinessObjects BI report titled BEX NoPrompts that stem from the BEx query ZMK_QRY1 in Figure 4. This is a relatively simple example of the lineage (note the Lineage tab highlighted in Figure 4) of an SAP BusinessObjects BI report, but one can easily see how this information brings together both sides of the story. First, the build of the data objects in SAP NetWeaver BW, then the consumption of those objects over in the SAP BusinessObjects BI system title BOE40 complete this example. In Figure 5 is a similar view of this graphical mapping, but from the other direction (note the Impact tab highlighted in Figure 5). It shows the impact of changing the source field ZAMT_SOLD in the DataStore Object ZD_SALES. The field example shown in Figure 5 is for an amount field. The mapping structure to the right shows all the field mappings that will be affected in SAP NetWeaver BW if this field's definition is changed. This is a very simple example, but in a mature enterprise, this diagram and attributed impact could be quite large and complex. The important thing to keep in mind is that logical mapping is now available for any field in SAP NetWeaver BW after collecting metadata using the collection task illustrated earlier. Figure 6 shows the impact of changes made to the SAP NetWeaver BW DataStore Object called Shop Sales on an SAP NetWeaver InfoCube (ShopSales) in NetWeaver BW through a transformation object (ZD_SALES). SAP Information Steward then maps the InfoCube (ShopSales) to the corresponding BEx queries. These queries will be affected if any change happens to any of the preceding objects as will the BusinessObjects BI reports displaying on the far right under the BOE40 block. Any of these examples show an enterprise end-to-end view that is possible with SAP Information Steward's Metadata Management module. This view can empower a BI organization to perform better and develop more efficiently by seeing the impact of issues before they occur, rather than blindly developing content and hoping for the best.